Have you have recently lost a tooth or are you frustrated by your dentures? Don't worry, you're not alone in wanting to find out more about dental implants in Manchester. The UK already has many long-term denture wearers and many more who have had a tooth extraction. Previously, the only real options for replacing lost teeth were dentures or bridges. Today, whether you’re looking to replace multiple teeth or just need a single tooth implant, Manchester residents are able to restore their smile with confidence, permanently. A dental implant is a titanium post which acts as a prosthetic tooth root that is surgically placed into the jawbone. We use medical grade titanium because it’s strong and light, but also because it has the ability to fuse with living bone. Once the implant has fused with the surrounding bone tissue, it can then be used as a foundation for a replacement tooth which is secured to the top of the dental implant. It can also support multiple implants such as bridges or dentures. In fact, for natural looking and secure replacement teeth, patients visit us for dental implants from Wilmslow to Stockport. After fitting, they find that their eating and speaking ability has improved along with their confidence to smile again. That's why dental implants are the gold standard for missing teeth replacement! When we lose a tooth, the impact goes beyond aesthetics. Did you know that our teeth actually play preventative and structural roles? They help keep our adjacent teeth in proper alignment and also preserve the surrounding bone structure. Because tooth loss can create an imbalance in the mouth, leading to gaps, shifting teeth, and a misaligned bite. Check out some of the other benefits that dental implants in Manchester can bring. Improved appearance - No more unsightly gaps, plus bone structure is preserved to help maintain the natural shape of your face. They offer a permanent solution – Dental implants fuse with your jawbone so they function and look just like natural teeth that can last for many years. Firmly secured – Implants are more comfortable than dentures and there's no need to worry about them slipping or sliding around your mouth when eating or talking. Preserve healthy teeth – Dental implants don’t require adjacent teeth to be altered or damaged. What's more, they can also aid oral hygiene as they're easier to clean than other alternatives. Dental implants are suitable for the majority of patients, although there are a few factors that need to be taken into consideration first. Certain health problems for example can affect the success of dental implants. This includes uncontrolled diabetes, along with lifestyle factors such as smoking. That said, the good news is that even these factors don't necessarily exclude a person automatically. Before having dental implants, all patients will be first be asked about their medical history and any possible complications will be explained thoroughly. In order to have an implant, Manchester patients must have sufficient bone and healthy gums to support dental implants. Stockport, Didsbury, and Wilmslow residents are encouraged to visit us at Church Road Dental and Cosmetics for a consultation so that they can ascertain the best solution for them. During the consultation our dental team will discuss the different types of dental implants available. 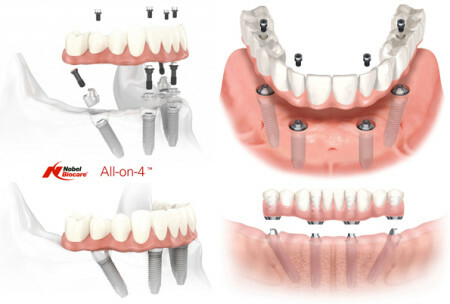 If you’re in a hurry for your new smile, and are missing multiple teeth, All-on-4 dental implants offer an efficient and effective treatment technique. Using four or more dental implants, Manchester patients can have a secure, permanent set of natural looking teeth without waiting weeks for the implants to heal. Instead, you’ll get your new smile in just one single visit. This treatment offers our patients either a full arch or both arches of fixed replacement teeth that are positioned to maximise the structure of your jaw bone while helping to restore your confidence. These specially designed dentures are held firmly in place by using two or more dental implants. Although you can still remove them for cleaning, they have excellent retention and don’t slip, slide, or shift about. They snap securely into place on the dental implants so Manchester patients no longer need denture adhesives such as powders and pastes. Did you know for example that with conventional dentures, your chewing ability is - at best - only 15%? On the contrary, having implant-retained dentures restores full stability, meaning you can once again enjoy eating all your favourite foods. Finally - implants can accommodate either full or partial dentures. They not only look better because they restore missing teeth, but will also maintain your facial structure by preventing bone shrinkage. They can also help to reduce wrinkles around the mouth area by providing sufficient lip support. If you have only one missing tooth then a single-tooth implant in Manchester is an ideal solution for your smile. It’s a great alternative to a bridge as it restores the gap without sacrificing any of your neighbouring healthy teeth. A small titanium post is positioned into the jaw to replace the missing tooth root. Once the implant has fused with the remaining bone tissue it should be strong enough to support the replacement crown. Your crown will be designed to match the surrounding teeth for an extremely natural result. With the proper care of an implant, Manchester patients can expect years of comfort and functionality. An implant retained bridge is used when more than one tooth is missing. It’s very similar to a traditional bridge but is supported by implants instead of natural teeth. In doing so it has many advantages. An implant-retained bridge helps provide additional strength to the jaw bone and also remains resistant to decay. 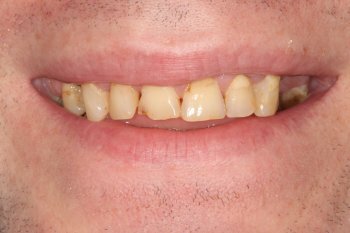 Once fitted the bridge will feel more comfortable and secure than a removable partial denture. You' ll be able to eat and drink food as normal and smile confidently with your new natural-looking restoration. Why choose Church Road Dental? If you’re considering dental implants in Didsbury, Stockport, Wilmslow or any other surrounding Manchester area then come and visit Dr Shi Karim and the team here at Church Road Dental and Cosmetics. Our implant dentists are highly experienced and over the years have successfully fitted many patients with dental implants. Manchester residents can be assured that at our state-of-the-art practice we use the very latest technology, the very best in implant brands, and we achieve success rates which are above industry standard. Whether you’re looking to replace your full dentures or need a single tooth implant in Manchester, why not book a no-obligation consultation with us here at Church Road Dental and Cosmetics? Call us directly on 0161 486 0743 or fill in the contact form on our website www.cheadlehulmedental.com. We look forward to meeting you and helping you restore your smile with confidence.